"The people of Rotifunk taught me more about faith, humility, endurance, and love than I could've ever imagined possible in such a short amount of time." I’m not sure that I could ever find the words to accurately describe how much this experience meant to me. The people of Rotifunk taught me more about faith, humility, endurance, and love than I could’ve ever imagined possible in such a short amount of time. I wasn’t quite sure what to expect before going on this mission trip, but it definitely exceeded any expectation I could’ve had. One of the most impactful experiences for me were the Outreach Clinics. It was special to get to actually interact with the people in the villages and see their need and be able to help them and give them more information about the hospital. I also got to practice some medical techniques of my own which will be beneficial to me in my future. We had a lot of success with the clinics and I feel that, with time, they could be even more successful. Playing with the kids was also a highlight of the trip for me. I wasn’t sure how well playing limbo or with the rubber ball would go over given that we weren’t really able to explain what they were supposed to do, but the kids caught on quickly and seemed to really enjoy it. Another thing that stood out to me was how hardworking Dr. Asante, Lumeh and Arthur were. You can tell they really appreciate their jobs and want the absolute best for their patients. They all knew off the top of their heads each patient's’ status and that was impressive to me, as I don’t know if that would be the case in American hospitals. I also appreciated how Dr. Asante and Arthur allowed us to watch a surgery, and explained what he was doing throughout. I learned a lot about the kind of doctor I want to be from them. No matter how big of an impact we may have made on the people of Rotifunk and the surrounding villages, they made an even bigger impact on me. The happiness and love they exude is unparalleled. I hope that I am able to take what I learned from them and apply it in my life back here in the States. I also hope that I can one day be even half the source of Jesus’ light and love that they are. I am forever grateful for and humbled by this experience, and I pray that I am able to return someday. 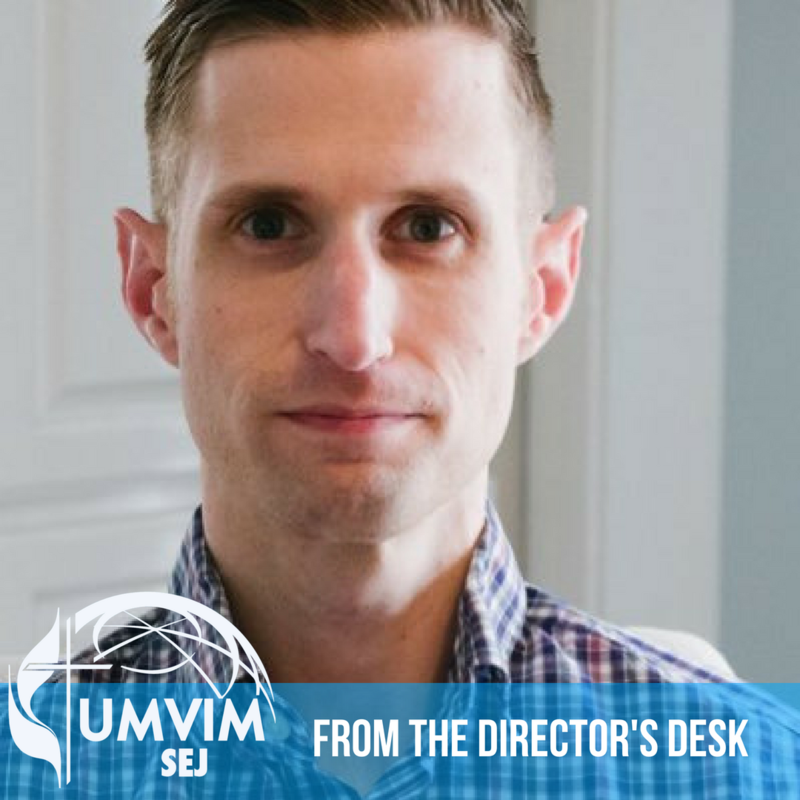 The staff and board of UMVIM, SEJ are excited to welcome Kennedy Martin and Michael Parisher as our 2018 Summer Interns. Through this program, these two emerging leaders in the United Methodist Church will have the opportunity to cultivate leadership skills, vocational discernment, and explore their calls to ministry through immersive mission service. Get to know this year’s interns by reading below! I live in North Carolina and attend Wesleyan Chapel UMC. Our church is starting to think about a foreign volunteer opportunity. The organization we were working with in Honduras is changing their focus. They are realizing that by saving projects for volunteer groups to do, many capable people from the local area went without work. They are moving more toward hiring local people to do the work – while donations continue to come from donors in the USA and Canada. 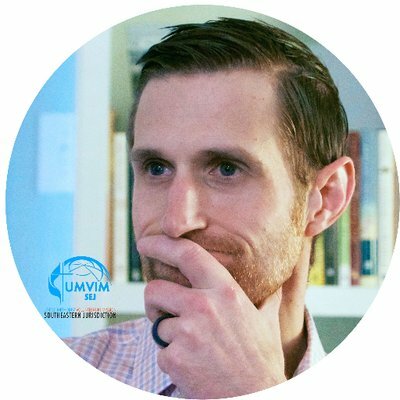 My question is this: How does UMVIM work with the local people? When volunteer groups go into countries to start or to complete projects, how are the local people included? If we go to do a project, are we taking work away from those who desperately need work? If local residents are involved, are they considered the experts in building practices in their country, or are we Americans seen as the experts and things are done our American way? Many times we go to serve with great love and a desire to serve. We want to do good things. But in our desire to help, we can end up crippling the very people we desire to serve. I would never want to do that. These are important questions that any short-term missioner should take into consideration. One of my mentors told me about a mission team he led to Chile. Part of the team’s work was to build a church in a high-altitude hamlet. As they were pouring the foundation for the church, my friend shrugged off some construction advice from the locals. He assured them he had done this type of work before. By the end of their stay, they completed the work that needed to be done and soon headed home. A decade later my friend had the privilege of going back to that community and worshipping at the very church he had worked on all those years ago. It was a beautiful building—aside from one side of the structure which was sagging and uneven. He realized that was his work, and he recalled the advice he ignored from a local construction coordinator. When we go out to serve, we do not go to impose our selves, our culture, or Christ. We go to share our selves: our ideas and experiences of Christ we have discovered in our own lives in hopes of learning something new. This means that we listen more than we speak, and trust those we are seeking to be in ministry with as the experts. We do not have every answer, nor do we claim our way as the only way. Members of the United Methodist Church should be proud that UMVIM, Global Ministries, and UMCOR place a strong emphasis on empowering local communities to take a lead role in developing and promoting volunteer projects. Often that means hiring local workers, such as construction experts and coordinators for food, transportation, translation, housing, and volunteers to receive and resource mission teams that come to work with them. I still wrestle and struggle with the efficiency of sending funding to employ local community members rather than for a mission team to spend thousands on airline tickets and other accommodations. And frankly, some studies have shown that simply giving money can have extremely positive results. I do know, however, that I would never be in ministry today without being part of a team that went to serve with a community halfway around the world. I would never have been given the opportunity to wrestle with these questions or enrich my understanding of God in the ways I do now. (See my last post about voluntourism). Part of our role at UMVIM, SEJ is to wrestle with questions like these with members of United Methodist Churches in the Southeast Jurisdiction. We may not have the answers to those questions, but I hope together we can explore together what those questions mean for us, God, and all of our sisters and brothers around the world. Have questions or thoughts about the work of United Methodist Volunteers in Mission? 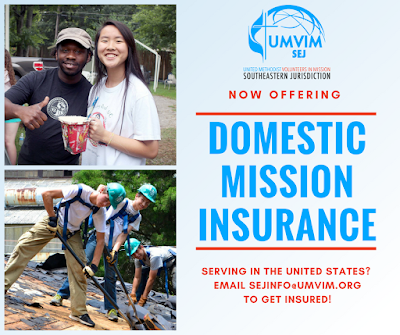 Feel free to email sejinfo@umvim.org to add your voice to the conversation! 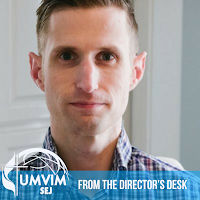 UMVIM, SEJ exists to provide volunteer teams with all of the resources they need to interact as servants of Christ through short-term mission service. This includes ensuring that volunteers who serve throughout the 50 states have all the coverage they may need in case of an unexpected issue. This new coverage provides an expansive list of benefits for teams traveling throughout the country, such as accident and sickness coverage, emergency medical evacuation, roadside assistance, remote physician consultation through telemedicine, trip interruption and cancellation, and more! Domestic insurance covers additional items that some international plans do not as well as the costs of out-of-network medical care in the United States. Though this results in a slightly higher rate than an UMVIM international plan, it provides substantial protection to mission team members, leaders, churches, and families. 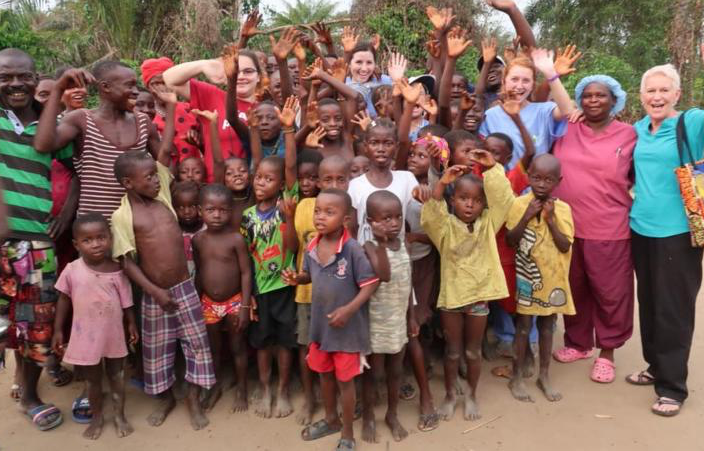 Mission Voluntourism: Yes, it is Still Worth Going. haven’t heard it before, type it into your favorite search engine. Some use it as a pejorative to describe Christians who go on “mission” trips as an excuse to add another stamp in their passport. I have been guilty of that, as well as thinking that travel makes you a more interesting person. Critics of the term—and some critics of mission trips in general—have rightly pointed out that sometimes the most economically effective way to help a community in need would be to take all that money you pour into a plane ticket, visas, travel adapters, etc. and instead use it to make a long term impact: pay for community based medical staff, make a donation to an already established and trusted NGO, or designate it for training for community members. Economically speaking, they are correct. Most of the time the expense of getting on a plane, getting a visa, and making a mission trip t-shirt with your church’s logo on it pales in comparison to the cost of community-based sustainable aid. in line. We should never prioritize our experience at the expense of another person. All of us do need to ask: why are we going and what do we hope to get out of it? changing experience. Some of us go on mission trips expecting to “save souls,” and in reality the only soul that gets saved is our own. I know from experience. reading scripture in a different way, and I started to feel God calling me to do more. completely destroys them in order to make way for growth in one’s faith journey. that lesson at the expense of those we are serving with. up with my arrogant intentions and expectations in order to let God work in my life. we teach, and seeing God in each and every person we meet. Stay updated as more information comes at UMCOR's Puerto Rico Volunteers page. Giving Tuesday 2017 is TODAY, and we hope that you will partner with United Methodist Volunteers in Mission, Southeastern Jurisdiction to promote, encourage and enable people to exemplify "Christian Love in Action" through short-term mission service both at home and around the world! Please give generously by clicking here! 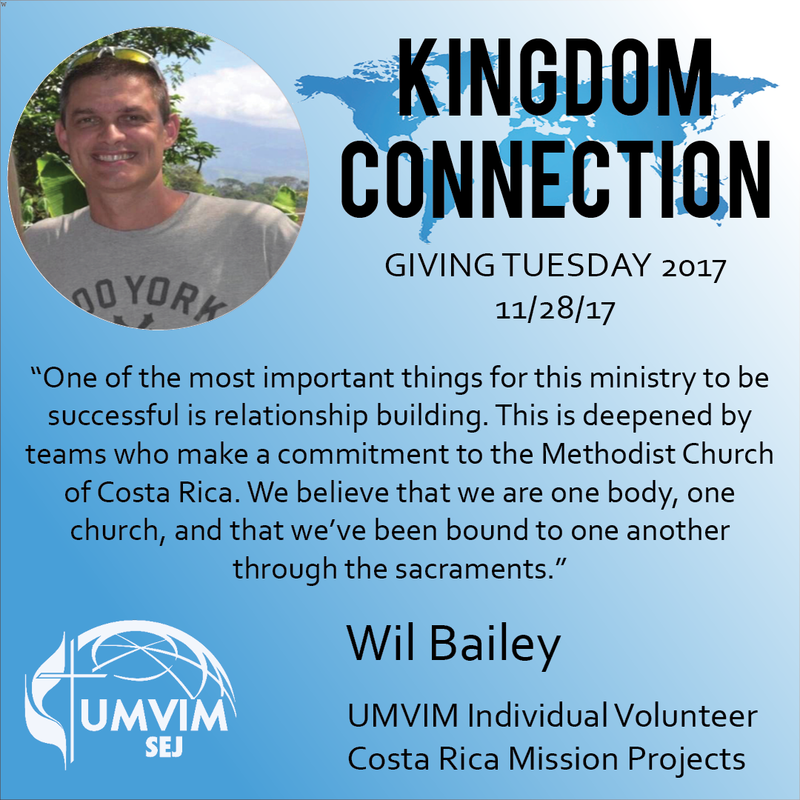 Our next #KingdomConnection is Wil Bailey, a missionary who works full time with Costa Rica Mission Projects. Bailey is originally from the North Carolina conference. He has been involved in mission work in Costa Rica since participating in an UMVIM trip at 15 years old. 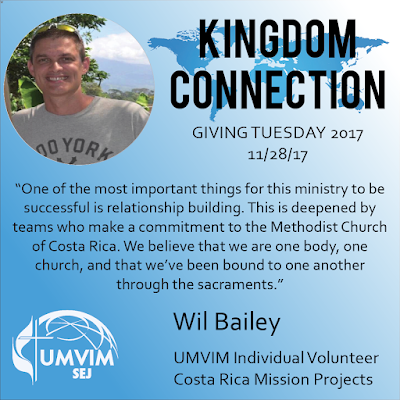 As an international leader, Bailey speaks firsthand to the important work that UMVIM teams partake in when committing to building missional relationships around the world. What motivations do you think are important for mission teams to have? Wil: We talk a lot about Acts 1:8 which say’s to be Christ’s “witnesses in Jerusalem, Judea and Samaria, and to the ends of the Earth.” Jesus chose that as his last words to his disciples before he left the Earth. Considering this, I assume he probably chose those words pretty carefully. After 3 years with the disciples and everything they’ve been through, that is what he wanted to make sure was heard before he left: that the church has to be present wherever we can be! Sometimes that means in your back yard or church, like Jerusalem was, or it could mean “to the ends of the Earth,” whether that be Costa Rica, Africa, or Asia or wherever else. I think what’s important about that message is that we can’t choose to overlook Jerusalem because it’s not as exciting as the ends of the earth, but we can’t neglect the ends of the earth because of the more local needs in Jerusalem. You have to have balance. I hope coming to Costa Rica is a part of a broad spectrum of missions that resembles the call of Acts 1:8. I hope what motivates the people that come here is the undeniable urge to be obedient to the call to be Christ’s witnesses throughout the world. What does a good relationship between an UMVIM team and your project look like? Wil: One of the most important things for this ministry to be successful is the relationship building aspect of missions. We believe that we are one body, one church, and that we’ve been bound to one another through the sacraments. While teams are here, we hope that communion happens in all kinds of ways as well as hopefully being able to celebrate that sacrament with local churches here. That relationship building key goes much deeper when we have churches that make a long term commitment to the Methodist church of Costa Rica. That doesn’t mean that you can’t experience what’s beautiful about this if you don’t come year after year. There are some churches whose vision for foreign missions is to go somewhere different every year to experience the church in as many different places as possible, and I can see some value in that. There are some churches who do a rotation between a foreign trip, a domestic trip, and a local outreach trip, so we’ll see them once every three years and kids get to come at least once while in high school, and I can see value in that too. But I can say that the churches we have the deepest relationships with are the ones that come every year. They get to know, not just me and my family, but the Costa Ricans that work here. Through these relationships, you realize that in spite of all the differences in our lives, what is most important to me is also what is most important to you. The same God that abides in me, abides in you. We all share that. What do you think it is that makes relationship building so dynamic on a mission trip? Wil: There are a lot of things in our daily lives that keep us from seeing and serving the people around us in the way that we were created to. When you come on a trip like this and you can leave most of the distractions at home, you really live into it from the moment that you wake up in the morning to when you go to bed at night. It’s overwhelming when you feel the peace of of realizing that THIS is what I was created for- to serve selflessly and also to let myself be served. That’s a super important of the puzzle- when people realize that they’re not coming to just do stuff for everybody else, but rather to serve and be served. The disciples had to get to the point where they allowed Jesus to wash their feet and humble themselves to admit that they needed that in their lives. There are things that Costa Ricans have in their life that we, as Americans, need in our lives! It’s a difficult thing for us to admit coming from a “do it yourself” culture. If we can get over that and realize we don’t have all the answers and that we don’t do everything right. There are things that are missing in our lives that our brothers and sisters in other countries have in spades, and LOVE to share with us. Long term relationships are reinforced by the ways teams are able to SHARE on a spiritual level with the people of Costa Rica. Wil: I had noticed one Sunday sitting in church in Costa Rica that, for most of their lives, many of the kids in the church had grown up with mission teams coming to work at THEIR church. I realized that if we aren’t careful, then we’ll be leaving a skewed idea of mission being something done AT them. There was a team from First United Methodist Church in Blue Springs, Missouri that was here that week. I said to their leaders, "How cool would it be if we could take a group of youth from THIS church and give them an opportunity to GO and serve in the States?" Well, six months later, Hurricane Katrina hit the United States. A few months after that, FUMC Blue Springs sent me an email saying that they would send us a check for as many plane tickets as we could get to meet them in Biloxi. So we took a group of youth from Costa Rica to serve with FUMC Blue Springs in Biloxi for a week doing hurricane relief work and it was amazing. We realized immediately that we HAVE to be doing this more often simply because the call of Acts 1:8 means the exact same thing to Costa Ricans as it does to us. So we have made an effort ever since then to continue bringing teams to the United States from Costa Rica. What have the trips the USA revealed about how the two cultures perceive each other? Wil: After partaking in a worship service in Costa Rica, visiting teams will discuss how even though it was two and a half hours long, it didn’t really seem that long. They talk about how there was a freedom of the Holy Spirit that was different than what they were accustomed to in the United States. Those two impressions show me this: That we are all just doing fine.